After the classy film noirs of the 1940’s, Robert Aldrich’s adaptation of Mickey Spillane’s hardboiled crime novel Kiss Me Deadly (1955) was as tough and uncompromising as its protagonist Mike Hammer. The film reflects the Cold War paranoia that was rampant during the 1950’s and fuses it with an apocalyptic science fiction climax that still packs a powerful punch after all these years. Aldrich worked for RKO in 1941 as an assistant director and got his solo start on the anti-American film Apache (1954) and the cynical western Vera Cruz (1954). 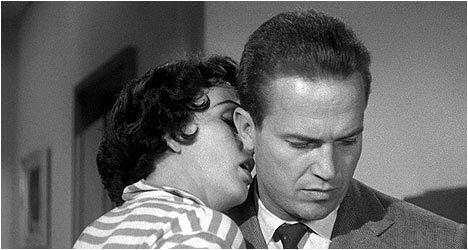 The edgy Kiss Me Deadly ran afoul of the MPAA during the script stages for its depiction of drugs and violence. Aldrich removed the drugs but the violence remained and upon its release he defended it in the press. The film begins with a barefooted woman (Leachman) running breathlessly along a stretch of highway road at night. Mike Hammer (Meeker) nearly runs her over. He picks her up and it’s a decision he will regret later. Even though Hammer gives her a hard time he lies for her at a police roadblock when he finds out she’s escaped from a mental hospital. However, they are run off the road by three unidentified men and over the soundtrack we hear the woman’s terrified screams which carry over to the next scene where she’s being tortured but all we see are her dangling feet, leaving the rest to our imagination. The men attempt to get rid of Hammer and the woman by staging a car accident that he somehow survives. Once he gets out of the hospital, government officials unsuccessfully grill him. Why? And who was the mysterious woman and why was she killed? Intrigued and understandably pissed off at almost being killed, Hammer decides to get some answers – ones that lead to something bigger than he could have possible imagined. Kiss Me Deadly is saturated with a paranoia vibe, like when Hammer comes home from the hospital and carefully checks out his apartment for intruders. Later on, his secretary, Velda (Cooper), warns him to stay away from the windows because “somebody might blow you a kiss,” which implies that someone is trying to kill him. Aldrich employs shots of Hammer talking to people as if he’s being spied on by someone and this keeps the viewer on edge. Later on, things get serious when Hammer finds dynamite and a bomb rigged to blow up his car. Aldrich also doesn’t skimp on the violence, which must’ve been shocking for its time. Hammer viciously beats a man who tries to kill him with a switchblade by punching him down a flight of steps. In another scene, Hammer disables a henchman so quickly and efficiently that he scares off his cohort. Ralph Meeker anchors the film with his uncompromising performance. Hammer is a crude, sexist man with a deep distrust of authority, anticipating Dirty Harry by several years as a righteous avenger with his own brand of justice. Meeker is a good-looking tough guy that does a fantastic job of portraying Spillane’s protagonist. Kiss Me Deadly features a smart, cynical screenplay by A.I. Bezzerides who tweaked the book’s setting and removed the first person voiceover, but retained the hardboiled attitude. Aldrich’s film takes us on a journey through the seedy underbelly of Los Angeles culminating in an explosive finale that would influence the likes of Repo Man (1984) and Pulp Fiction (1994). It came out around the time that other grim, bleak noirs, like Pickup on the South Street (1953), were starting to appear, and anticipated films like Touch of Evil (1958) Don Siegel’s The Killers (1964). There is an audio commentary by film noir experts Alain Silver and James Ursini. They talk about how Kiss Me Deadly is a commentary on the 1950’s. They point out innovative things for the time, like how it begins in the middle of the action before any opening credits, which play over the film backwards like a road sign. They point out that Aldrich wanted to turn the source novel on its head and use the female characters to comment on and critique Hammer. In addition to the excellent analysis, Silver and Ursini provide biographical and production information on this solid track. “Director Alex Cox on Kiss Me Deadly” features the English director praising the film and talking about how radically it differs from Spillane’s book. He describes Aldrich as a “bold and radical” filmmaker. “Mike Hammer’s Mickey Spillane” is a condensed cut of a 1998 documentary about the author’s life and career in which he also agreed to participate. Fellow writers and admirers speak highly of the man and the innovations he pioneered in crime fiction. Fascinatingly, Spillane wrote for comic books in their early days along with Stan Lee and Jack Kirby. This is a fantastic primer on Spillane and his work. “The Long Haul of A.I. Bezzerides” features excerpts from this 2007 documentary where writers Barry Gifford, George Belecanos, Spillane and Bezzerides talk about the film version of Kiss Me Deadly. Spillane criticizes the script as “lousy,” while Gifford calls the film a classic. Bezzerides says that he changed what he didn’t like about the novel and wrote his own version, “fixing” it. “Bunker Hill, Los Angeles” features writer and L.A. film buff Jim Dawson talking about some of the film’s locations. We learn about the rise and decline of the Bunker Hill neighborhood. Dawson points out where in the city key scenes were shot in this fascinating tour. “Altered Ending” shows the truncated ending which offers a much different fate for Hammer. A minute of footage was cut out from the film and finally restored in 1997, which is the version of the film that is on this DVD.